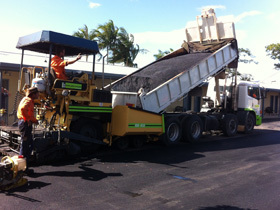 Bitumen Patch and Pave is a locally owned family business, which has been established in Cairns for over 20 years. 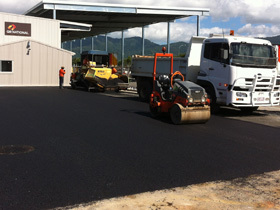 We offer obligation free measure and quotes and service all areas in Cairns and beyond, and pride ourselves on quality asphalt works from pothole repairs to large-scale commercial projects. Over time, we have retained many return and regular clients who trust us with their asphalting requirements because of our quality workmanship, competitive pricing, reliability, experience and old-fashioned customer service. Asphalt is a non-slip, cost effective, durable, low maintenance and visually appealing alternative to concrete for any residential, industrial or commercial application. Our team regularly has patching days each week which helps keep the cost of pothole repairs to a reasonable cost for our clients. If there has been a pipe burst, or a new cable needs to be laid underneath your asphalt, we are able to reinstate this area neatly when your contractor has finished. Remember to stress to your contractor to properly prepare the subgrade for asphalting, otherwise if the subgrade sinks, so will your new asphalt. This applies to all subgrade works that we do not prepare ourselves. We can make asphalt speed humps to your specifications! Just let us know what you require from your plans and we will make it. Whether it is a big commercial car park, or a new parking bay at your home we have the equipment and know how to give smooth and durable result. We also have contacts in the line marking industry and can refer you to them if required. 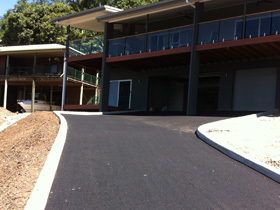 An asphalt driveway is a visually appealing and practical entrance to your home, business or farm. Beautiful curves can be incorporated to enhance your landscaping and will be an asset to your property. Your driveway will look great – and no more pressure washing mould and stains from your driveways surface! We enjoy being able to offer our clients solutions to those unusual or tricky jobs! Our staff are highly trained in handwork as well as machine work, and thrive on performing those challenging jobs! We don’t mind small jobs like bin bays and bike paths - the possibilities with asphalt is endless! Weeds (especially nut grass) can grow through your asphalt. Ensure your base (including road base) is not contaminated with seed. If you are unsure, poison the area prior to paving. 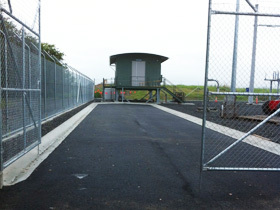 It is especially important to have a great base prepared for asphalt. A great base ensures a great result. Asphalt hardens and softens depending on the temperature. On really hot summer days, your asphalt can be softer than on a cooler day, so cosmetic scuffing can be more visible. These will usually disappear when the temperature lowers. As your new asphalt ages, these will happen less and less.